The striking Andover bathroom series from Wyndham Collection represents an updated take on traditional styling. Presented in a clean white finish with antique bronze hardware, the Andover Bathroom Linen Storage Cabinet is a keystone piece with strong, classic lines and superb attention to detail. Hand carved and stained, this cabinet is crafted with eco-friendly solid oak and is also available in black and dark cherry to complement any decor style. Have a little unused spot in your bathroom? This compact storage floor cabinet would be perfect! One interior shelf behind a tempered glass door and an open shelf provides storage space for towels, toiletries or paper supplies. This beautiful cabinet offers a surprising amount of storage for such a small footprint. 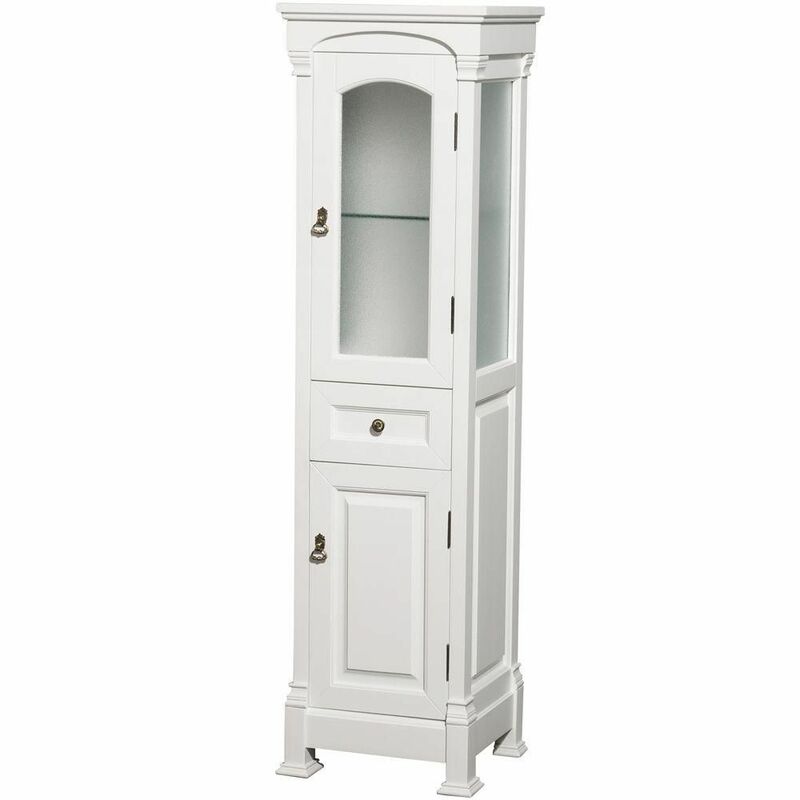 Andover 18-inch W x 65-inch H x 16-inch D Bathroom Linen Storage Cabinet in White The striking Andover bathroom series from Wyndham Collection represents an updated take on traditional styling. Presented in a clean white finish with antique bronze hardware, the Andover Bathroom Linen Storage Cabinet is a keystone piece with strong, classic lines and superb attention to detail. Hand carved and stained, this cabinet is crafted with eco-friendly solid oak and is also available in black and dark cherry to complement any decor style. Andover 18-inch W x 65-inch H x 16-inch D Bathroom Linen Storage Cabinet in White is rated 4.0 out of 5 by 3. Rated 5 out of 5 by Sharon from It was nice but too small for my bathroom. I... It was nice but too small for my bathroom. I will be returning it. Rated 2 out of 5 by Dianne from The product came packed in much styrofoam creating mess in... The product came packed in much styrofoam creating mess in the bathroom! It was to have two shelves according to description but only came with one. The textured glass front door has noticeable streaky flaw. Door magnet improperly placed so doesn’t work. I would not recommend it.